What aspects of each drawing have been successful, and what did you have problems with? I drew this drawing from scratch without sketching in pencil first in this aspect I think I did really well. However I found it very difficult not to start hatching to depict tone and so I probably went overboard on the pumpkin but I feel that it was better to but too much effort in than two little. I was also dissatisfied with the pumpkin because the actual surface wasn’t as rough or bumpy as what I made it out to be in my drawing. In both drawings. The only problem I had with this is I should have chose a composition that used up more of the paper. I also could have been more adventurous with the subjects that I chose. Apart from that I think I did really well with depicting tone and none of the objects look out of place. Did you manage to get a sense of depth in your Drawings? What elements of the drawings and still life groupings helped create that sense? This is one thing I did not have a problem with with the Still Life Group Using Line exercise I did this by placing the tallest objects at the back. With the Still Life Group in Tone I looked down at the group from an angle. What difficulties were created by being restricted to line or tone? Like I said earlier sometimes it was very difficult not to cross the fine-line between drawing with line and hatching. I started with a bit of a study to firstly get the right composition for this exercise and then to try out different colours so I could find three colours that would give me three different tones for this drawing. 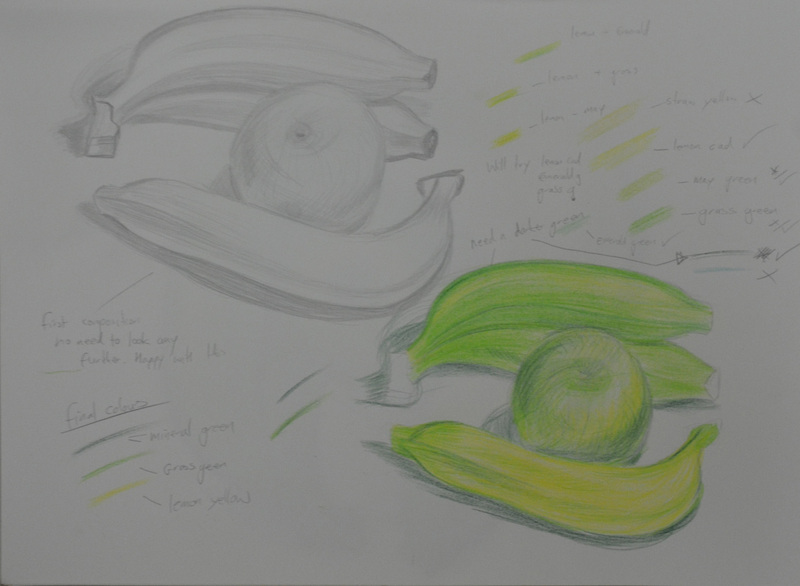 I feel like I cheated on this exercise as I chose objects that could be drawn easily enough with just three colours, a yellowy green banana, an apple and two green bananas but I just started a high fruit diet the week before and I used objects that were at hand. Like it instructed me in the brief I screwed up my eyes to take a look at the dark colours only and lightly sketched them in and then chose a different colour to sketch in the mid tones, then another for the light tone. On completion of the initial sketch I decided that my darkest colour was too light and so changed it for my final drawing. I changed the composition of my final drawing slightly so I could depict the full form of the apple and I’m glad I did. The final drawing took me less than two hours going at a really steady pace and I am really satisfied with the completed drawing and my choice of colours, It would have been nice to apply a fourth colour though and also maybe a variation in orange and reds. The one thing I am not happy with is the amount of blank space I left on the paper but I tried to make up for this by shading with my darkest colour. In the brief for this exercise I was to set up a still life group out of objects at my disposal, either objects that naturally connect together or deliberately contrast. For this I did a supermarket shop and purchased onions, a big chunk of knobbly Asian pumpkin and a red cabbage thinking about three objects that gradually went from rough to smooth. I had to think about the following questions: ‘How will I treat the objects?’, ‘How will their connections be clear?’, ‘How will I capture the differences between the objects?’, ‘How do the objects relate to their background? 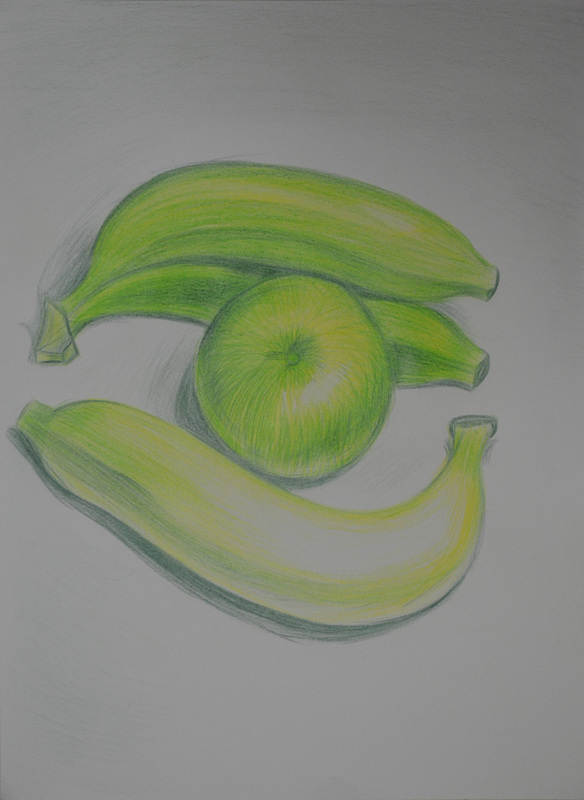 and ‘How will I reference the colour in the group in this drawing?. Then with these questions in mind I had to select a medium such as pen and ink, marker pens or fine black pen and A3 paper and begin to draw; which is exactly what I did. I wanted to use pen and ink for this drawing as I have kept delaying it but when i saw I would be using them in the next project I decided to use a Rotring 0.3 drawing pen. My objects had already been in the fridge a couple of days so they wouldn’t last long once I took them out and my SD card for my camera kept locking due to me removing it too often so I had to work fast as I couldn’t get a photo to work from in case I didn’t finish before evening came. There was no drawing this out in pencil first for me, I wanted to do start as I meant to go on and and put my Rotring drawing pen to paper. I started on the outline of the three objects together rather than drawing them individually then when the outline was complete I finished the shape of each object individually. 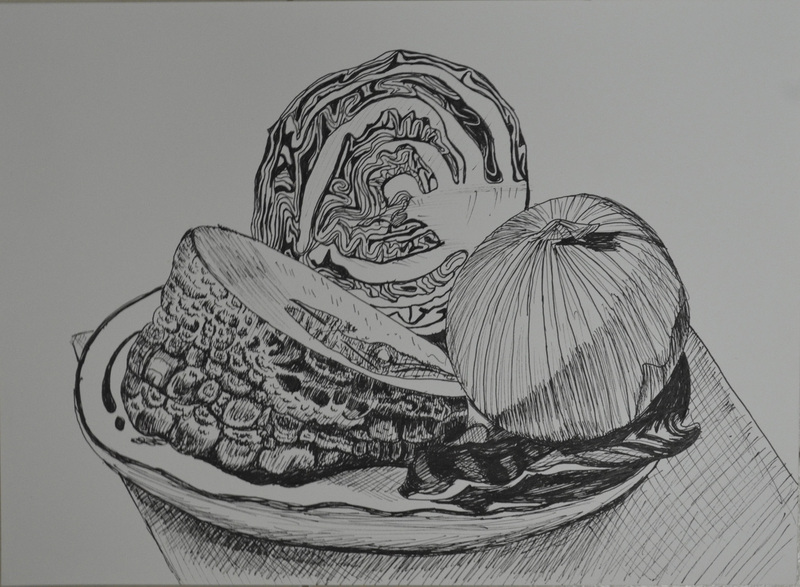 From there I started on the lines of the onion which were fairly simple and while I worked my way around the onion with a variation of light and dark lines (applying different pressures) I thought about how I was going to approach the different objects. Working from right to left I tackled the red cabbage next and it was extremely difficult; trying to view the patterns as a whole and then working on the lines individually was enough to drive me crazy. 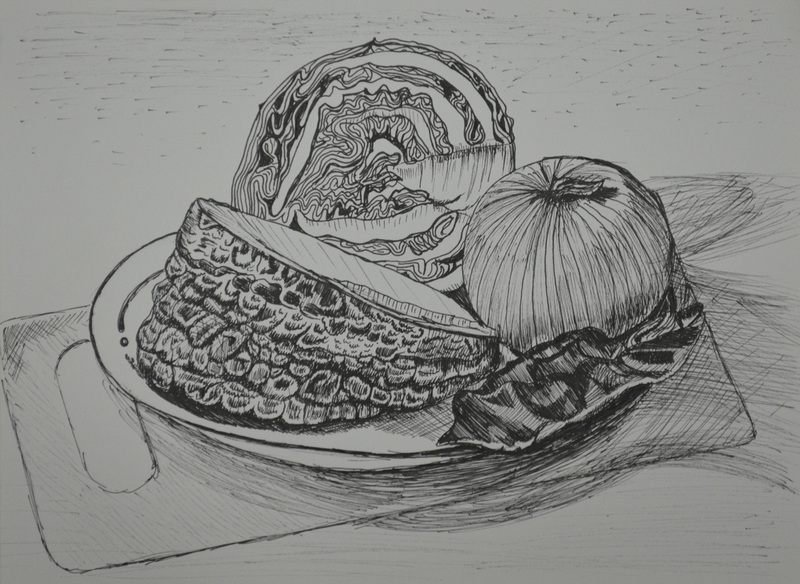 The pumpkin was the next obstacle and because this was a still life group using line I had to exaggerate the texture of the pumpkin at certain parts where there was no real pattern at all. It looks like I have tried my hardest to depict tone here but actually I wasn’t thinking about tone at all. I was just trying to complete the surface of the pumpkin with as many different line as possible, squiggly lines, short strokes, anything that came to mind. The cabbage leaf on the right of the drawing was probably the most difficult object in this drawing and was very difficult to draw without hatching to depict it’s smoothness which I wasn’t very successful in doing so. Then when I finished the composition I ruined the whole picture by doing some stupid speckle background and so I decided to have another go. This time I tried a slightly different angle and the finished drawing was cleaner but there are a lot more things that I am unhappy with. For one I don’t know how the cutting board got so out of shape the cabbage leaf didn’t turn out that great and the pumpkin surface was a little too exaggerated but certain parts of the pumpkin surface turned out a lot better.